Marlena Oliveira has—mysteriously, miraculously—been given the power to heal all kinds of ailments. People around the world believe she is a saint. But it all comes at a price. Because of her power, she’ll never be able to live a normal life. And the older she gets, the more trapped she feels. Then she meets Finn, a boy who makes her want to fall in love. For the first time, she begins to doubt her power—and herself. Is her gift worth all she must give up to keep it? And who would—or could—she be without it? This was definitely an interesting story. The book starts off with Marlena being known as Marlena the Healer. Due to a gift she received as a baby, she is able to heal any infliction presented to her. She has an audience every Saturday in which she performs these miracles. This is the only life she has ever known as her mother keeps her from the outside world with almost no interaction to keep her “pure”. As she gets older, Marlena becomes more curious of the world she has never known. Curious to the point where she decides to pursue a more scientific approach to why she is able to heal. As she walks in to Angie’s office, she never expected to meet somebody who would make her consider giving up healing forever. This book is filled with so many themes - growing up, love, loss, and faith. All of this was done excellently. While faith was a present theme, growing up and experiencing love and loss for the first time were the biggest themes. Even though she believes her healing is a gift from God, the relationship between the two isn’t as present. Marlena tries to do everything she has missed out on the past 18 years when she was dedicating her life to her mom and healings. The emotions and changes that Marlena go through bleed through the words. There are different tones throughout the book depending on what part of Marlena’s life we are reading from. These tones are done so well that I could experience when Marlena was at her happiest, and when she was at her loneliest. I do feel like this book was written very well and the emotions can really be felt. Marlena is what I imagined her to be. If someone who was sheltered with little interaction for 18 years decided to do whatever they wanted, that is exactly how I imagined they would be. Marlina does everything she has always wanted to do and even falls in love with a boy. Finn and Marlena’s relationship was great. They were exactly what they needed each other to be. Even though Marlena has some selfish moments, I was not thrown off by this. I found myself being glad that she did some of these things for herself. She would have never known her true self if she did not go through the changes she did. I was a little disappointed in the end and wish we got more of Marlena’s life after the events that took place in the end of the book. 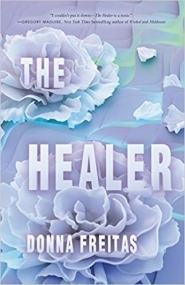 Overall, The Healer by Donna Freitas is a great book. There is so much going on throughout the book but it all blends perfectly. This was a great story on growing up and learning about love, loss, and faith. I highly recommend this book for those that want a moving tale about a girl trying to discover who she really is.